The death of a young boy at a remote schoolhouse and the supposed ghostly circumstance of the incident draws the attention of Florence Cathcart, a young woman well-known for exposing fraudulent supernatural happenings, to investigate the matter and uncover the true nature of the tragic event. With The Awakening director Nick Murphy and his co-writer Stephen Volk have crafted something special, a ghost story to get the blood pumping with a chill that lingers beyond the roll of the credits. Rebecca Hall and Dominic West lead the film as the emotionally constrained skeptic Cathcart and the beleaguered headmaster convinced of the paranormal nature of the boy’s death and the success of the film lies in the ability of the two to immerse themselves in their roles and the writing of the characters to allow them to overcome the challenges of the genre. 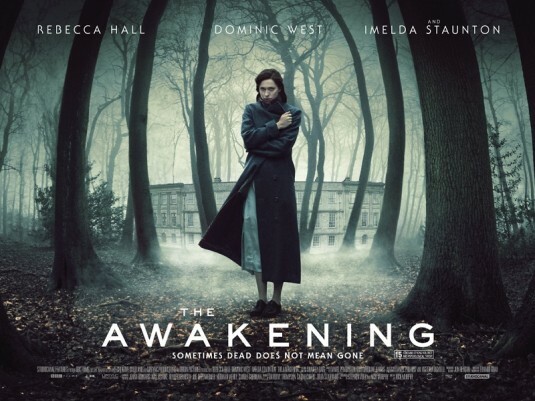 Defiant in the face of the decaying post-modern scary movie The Awakening evokes the spirit of the classic ghost story, with a genuine understanding of the creation and application of fear which needs no gore-strewn slaughterhouses or operatic disembowelment; this is a welcome return to the grip of death and its effects. The post First World War setting is a rich foundation for the themes of the story, with a rawness of feeling following the overwhelming scale of death, the new reality of a decimated generation and a shell-shocked homeland making the search for an afterlife a seemingly normal activity. West’s bruised and battered soldier returning to his profession as teacher is wonderfully played with a restrictive sense of duty to his boys (and a necessary return to the normality of teaching) tested by the unnatural death of a boy and the presence of the groundskeeper whose medical reasons for avoiding conscription or volunteering to fight are dubious at best. Death is in the air and the opening scene in which a séance takes place is heavy with the air of accepted and much-needed delusion that there is something more to this world. Rebecca Hall effortlessly holds the film together as the skeptic whose fearless pragmatism shelters and contains her own personal demons, and it is her awakening above all else which proves the story’s heart. She has an ability to ground a film in the real world that is most useful here, as the boundaries between this world and the next are glimpsed, disproved then begin to blur. Much of the imagery (unexplained presences in photographs, brandished candles seeking out unexplained happenings in darkened corridors etc) is familiar and yet, like Volk’s Ghostwatch, the path we are led down ends up somewhere very different to a place we might expect. Imelda Staunton’s kindly school nurse was never simply going to be virtue and reason, the surly groundskeeper was bound to crop up somewhere towards the end, the secret of Florence Cathcart’s past was never going to be a happy one and yet when the final twist of the knife occurs not only does it feel right and cast the whole film in a new light it also never cheats the audience. The Awakening is Murphy’s debut feature and it is an assured first film, making the most of the staples of the genre and allowing the script room to breathe. Where I found it worked best was the scene with the dollhouse (and if you’ve seen it you’ll know exactly which bit I mean) where the slow creeping fear is given the most effective treatment, providing a genuinely nasty and memorable moment. There is some CGI that drags a few scenes down, and I can’t help but feel that the decision to go with practical effects would have improved matters, particularly at one point where, if you’re looking in the right place, the unconvincing CGI rids the moment of any potential terror. But this is a rich and real ghost story, and I don’t mean the ‘classic’ setting or the lack of pretty, screaming teenagers. It understands what scares us and suffuses the air with a sense of dread and unease and stays true to its characters and the tone of the piece. The resolution may initially feel unlikely but it is evident and possible from the early scenes and as the characters are revealed and their motives unearthed everything comes together and the scares, when they come, are all the more effective because of it. Like the ghosts of the film, everything at the end has been with us, unseen, from the beginning.